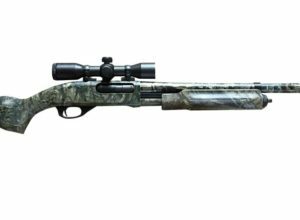 The TarHunt RSG series of slug guns are based on TarHunt’s own two-lug, custom control feed, bolt action design especially for slug guns. The action is drilled and tapped for standard Leupold or Weaver bases. The standard design boasts a glass bedded action with a free-floating, threaded-in heavy wall, fully rifled E.R. Shaw Stainless Steel barrel with a matte metal finish. SKU: RGS20. Category: Slug Guns. A $1000.00 minimum deposit required of which $500.00 is (NON REFUNDABLE) on all RSG-20 & RSG-12 Bolt Action Orders. The Mountaineer 20 ga. are only available in the “Stainless Steel ” for 2017. Muzzle brake and a 2 ½ pound custom Jewell trigger is NOW standard equipment. Scope and scope mounts not included. 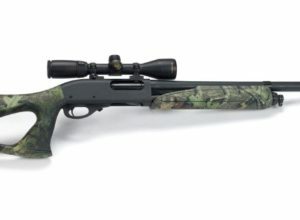 The TarHunt RSG-20 slug guns is based on TarHunt’s own two-lug, AWARD WINNING, custom control feed, cocked indicator, bolt action designed especially for slug guns. The action is drilled and tapped for standard Leupold or Weaver bases. The standard design boasts of a glass bedded action with a free-floating, threaded-in heavy wall, fully rifled 1-24tr, E.R. Shaw Stainless Steel barrel and a matte SS metal finish. A black McMillan fiberglass stock and Pachmayr Decelerator recoil pad complete the package. 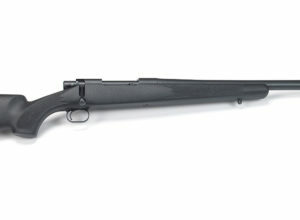 Standard RSG-20ga are chambered for 3″ slugs. There is a possibility of a custom RSG-20ga model with a “20ga.Schrifle Chamber”. All models carry a limited lifetime warranty, excluding abuse. To request modifications to the RSG-20 Mountaineer, please call 570-784-6368. **11% Federal Excise Tax has been added to the full component costs. (Items such as scopes, rings and Jewell triggers qualify as accessories and as such are not subject to Federal Excise Tax). Prices and specifications are subject to change without notice. Call for delivery times. Right or left-handed bolt action. 3" chambers in 20 & 12 ga.
One round chambered with one round down in blind magazine. Two rounds total capacity. RSG-20, 1-23 twist rate; RSG-16, 1-30 twist rate; RSG-12, 1-28 twist rate. Black textured epoxy painted McMillan fiberglass stock with Pachmayr Decelerator Pad. Standard models have approximately a 23 inch barrel including muzzle brake. Barrel weight & taper varies with gauge. 13-1/2 inches standard including Pachmayr recoil pad. Jewell Custom Trigger is now standard. Preset at 2 1/2lbs. Top mounted 700 style safety lever. Approximately 7-1/4 to 8-3/4 lbs depending upon gauge.